Help Ethiopia. Please Give to Rick Hodes. Save Lives from Spinal Tuberculosis, Poverty In Ethiopia. Truly Amazing Caring Man. Amazing Story. Please Give to Rick Hodes. Help Ethiopia. Please Give to Rick Hodes, Donate to Africa. Save Lives from Spinal Tuberculosis, Poverty In Ethiopia. Truly Amazing Caring Man. Amazing Story. When I got the invitation, I knew I wanted to go to the talk. I wanted to go, and I wanted to give. It was about a doctor who's spent the past 20 years in Ethiopia. It was supposed to be for a year. He stayed, treating illnesses most of us have never heard of, including tuberculosis of the spine - where the spine ends up looking like a pyramid, before it folds completely, paralyzing the person. It is treatable. The person, Dr Rick Hodes, is an amazing man with an amazing story. It gives me hope about what we humans can do when we live the right way - with love and caring. Among other things, to get the needed medical help (only available outside Ethiopia) for some of the kids he treats, he's adopted 5 children. That way they're covered by his (American) medical insurance. He does all he can - including that he shares his home with 17 of the children. When one left (to study in the States), he felt so bad about the one-half mattress that was available, that he couldn't rest easy until the kids could agree on whom to welcome into the house. Why am I writing? First, I wanted to share his story. Second, if you can afford it, I would love it if you gave. It would matter enormously to Rick Hodes and the children he cares for. Here is a direct link to donate. How desperate is the need in Ethiopia? There are 2000 doctors for 80 million people. One doctor for 40,000 people. As for the people Rick Hodes treats - there is no one else. The illnesses he treats don't grip the headlines, like aids and malaria. I had never heard of spinal tuberculosis - and had certainly never seen pictures of backs deformed by the illness, backs that can be straightened by surgery (while the tuberculosis is treated by drugs). How much goes for direct medical care? 100 per cent. Every cent. And Rick Hodes is an expert at stretching each dollar. There is a chemotherapy treatment that ups the survival rate from 15% to 60%. The cost: $1400. And again, here is a direct link to donate. And yes, I did buy the book. And yes, I did donate. By the way, maybe one last thing about Rick. He's a CNN hero - one of his children wrote in about all he did. Also, if you know anyone who might be interested, please send them to this page, or to any of the links above. Once again, Help Ethiopia. Please Give to Rick Hodes, Donate to Africa. Help Ethiopia. 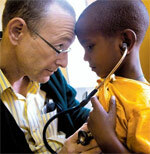 Please Give to Help Rick Hodes Save Lives from Spinal Tuberculosis, from Poverty In Ethiopia. Truly Amazing Caring Man. Amazing Story. in his life saving work with children with spinal tuberculosis. Help stop desperate poverty in Ethiopia. Donate to Africa. Help Africa. 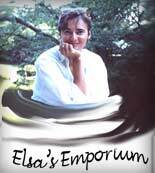 Elsa's Blog on poverty in Ethiopia, donate to Africa, please help Africa.